In the 1990s, before widespread Internet usage kicked in, it took some effort to keep up-to-date on what was happening around Vancouver. If you liked to attend cultural events and festivals, you would probably pick up a copy of the Georgia Straight and scour the events listings to see what you could attend. Soon after I moved to Vancouver from Ontario – in the midst of a recession – I discovered the Public Dreams Society. * the Illuminares lantern festival around Trout Lake. As a young woman who knew almost no one in Vancouver, their events were inviting, dazzling and inspired by the spirit of people and communities coming together. I recall seeing Paula Jardine, one of the founders of the society, and thinking that she looked like she had stepped out of a Pre-Raphaelite painting. I could see that the people involved were creating new, Vancouver-based and vibrant participatory events. It was exciting to see the “happenings” and, more importantly, to take part. When I moved away from Canada for five years in the late 1990s, I missed experiencing the society’s work. The main theme of building community on BCFamily.ca is inspired by the work of organizations like the Public Dreams Society. Vancouverite Jane Bouey shared in her recent interview (see link below) that the society’s events were one of the main reasons that she chose to stay in Vancouver. A few years ago I took my then boyfriend (now husband) to an Illuminares evening. We made our lanterns before we went and enjoyed taking part in the parade. I have never had the chance to attend one of their lantern making workshops but the home made lanterns I have seen in past years were creative and beautiful. More recently we attended a mid summer festival at Colony Farms in Coquitlam. 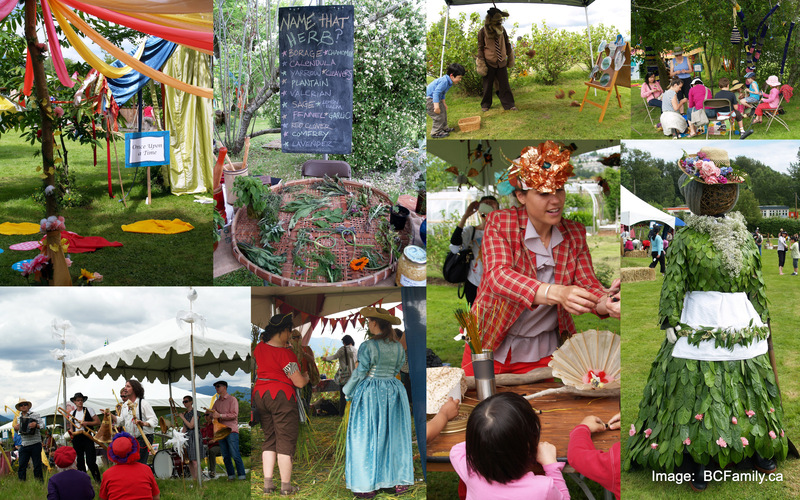 My three year olds responded enthusiastically to the activities and the artful events that day. 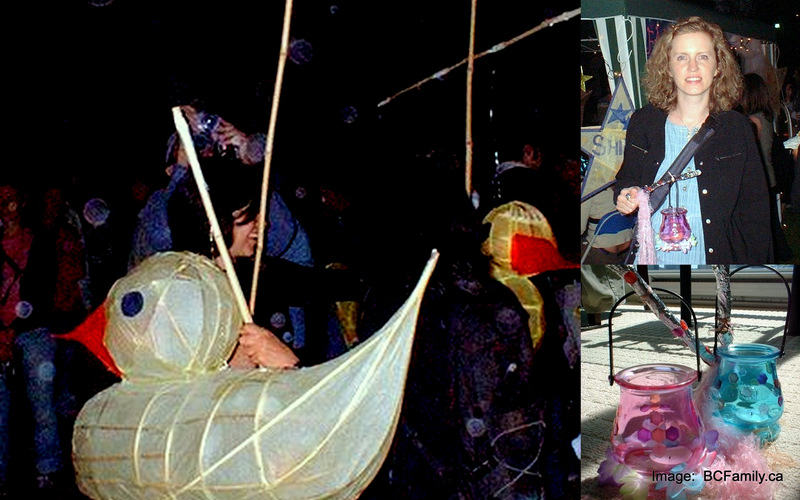 This year the Public Dreams Society will celebrate the 25th anniversary of the Illuminares Festival. It promises to be an exciting evening. Check out their website for more details, make a lantern at the event, arrive early, bring a picnic and don’t forget to donate some money. This is a free event so if your budget is under duress,don’t feel obliged to donate. However, if you can afford to do so, any amount of money that is donated helps. While the society is well funded, like many local arts organizations it is struggling to cope with accumulated debt and has reached a critical point that is affecting their ability to help support the collective expression of Vancouver’s creative dreams. As the Director of the society said recently in an interview, he believes that the work of the society is well integrated into the fabric of life in Vancouver. Even though this year will be the final year for the society to operate the lantern festival, the festival – supported by the local community – will go on. When July comes around, do you start to think about the Illuminares Festival? Have you attended in previous years? You can comment about this posting using the comment function below or by visiting the BC Family Facebook page. Your opinion matters so don’t be shy! Jane Bouey discusses the past, present and future of Illuminares with Matthew Bissett, the Director of the Public Dreams Society. Spoiler: This will be the last year that the society will organize the event.